How Much Does it Cost to Travel the World? This Might Just Shock You. 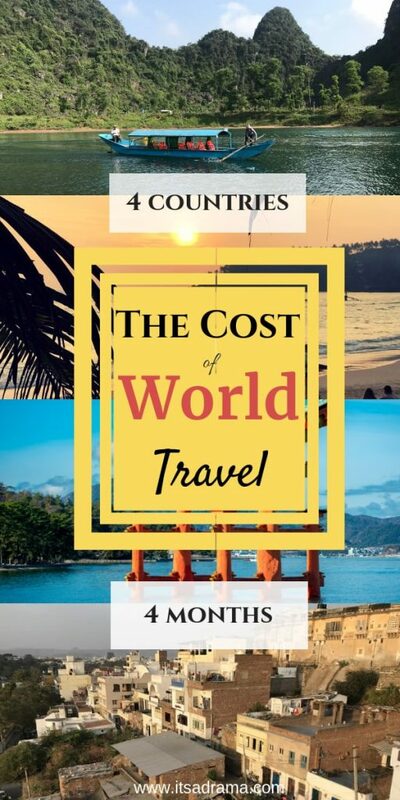 Cost to Travel the World. 4 Months In. This week marks four months since our family of four left New Zealand to travel around the world. The question that always arises when we tell people about our trip is, “How much does it cost to travel the world?”. Since January 2018, we have backpacked around Sri Lanka, India, Thailand, and we are currently in Vietnam. We have saved money by Couchsurfing, eating locally and never spending more than $20 on gifts for the kids when birthdays come around. We have met a variety of people and had some fabulous experiences in our quest to discover the most unique and underrated countries in the world. This post contains affiliate links to all the products and websites that we have used personally to save money on this round the world trip. If you use them, we make a small commission. They cost you nothing. Thank you! 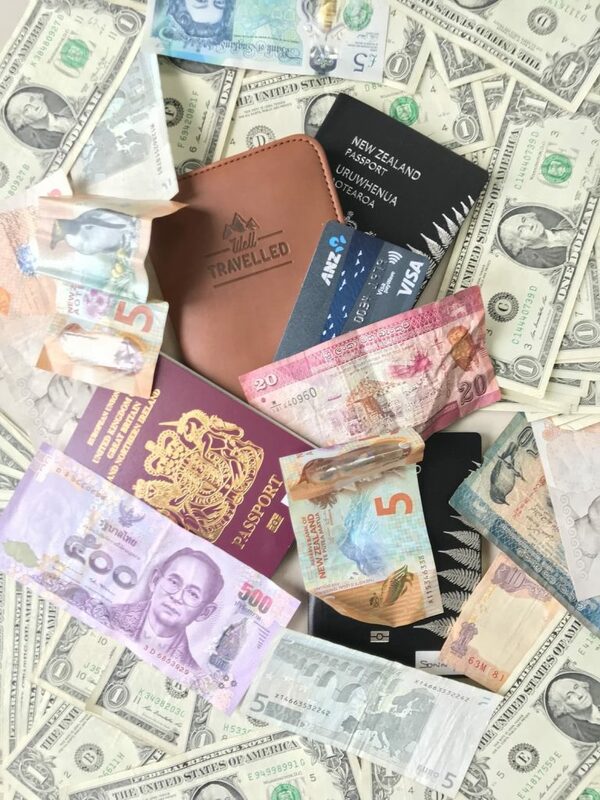 The Question That Everyone Wants to Know: How Much Does It Cost to Travel the World? Get saving! We are going to travel the world. 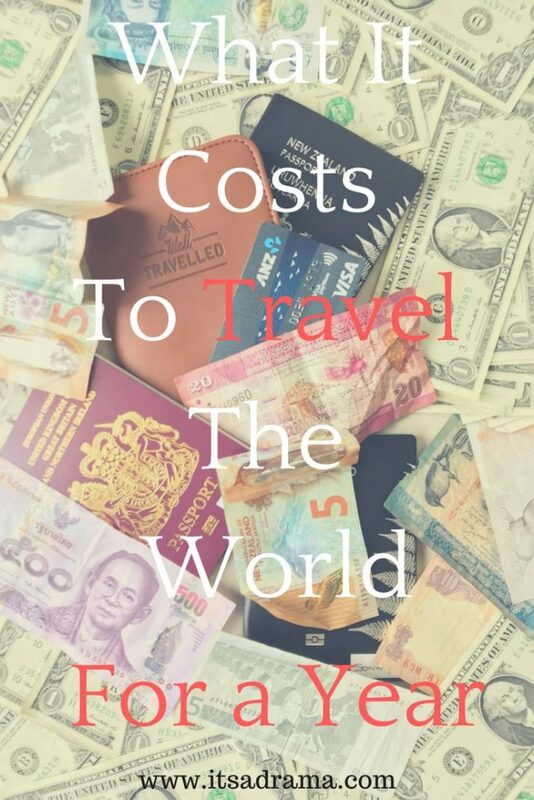 I think you may be surprised at the actual cost to travel the world. We have a budget of $110 a day but since travelling for the past four months in Asia we have managed to come in at around about $75. I know! Amazing hey?! That’s for a family of four remember, and we don’t really class our kids as ‘kids’ They’re more like small adult donkeys who like to eat a lot. Compare your countries currency here. Heres how we did it. The Countries we have Travelled to in Asia so far and how much it has Cost. Beautiful Sri Lanka. The perfect place to save money while travelling the world. We all loved Sri Lanka. It is a warm, friendly, beautiful country and, it is cheap. Perfect for those wanting to travel the world. We spent 25 days in Sri Lanka. You can read about a few things that took me by surprise in Sri Lanka here. We did spend a few nights Couchsurfing in Sri Lanka, but this was more to meet local people rather than to save money. If you are thinking of travelling the world and are wanting to do it with free accommodation, then I cannot recommend Couchsurfing enough. But, this is not a post on Couchsurfing. No guest house that we stayed in Sri Lanka was more than $20/night for a room. Most were $15, but $20 was top end. Lots of places have family rooms for a little extra cost, but this saves you paying for two rooms. We mainly used Agoda for booking cheap hotel rooms. You can also try Booking.com and Hotels.com. I always make a point of comparing the three – just in case – it might save you a few extra dollars. We very rarely ate lunch when we were in Sri Lanka – this wasn’t a money thing but because the owner of the guest house we were staying in for two weeks wouldn’t stop feeding us! Breakfast was $3 a person and was HUGE. To eat out in Sri Lanka is cheap. We ate out every night when we were there. You can expect to pay no more than $30 for a family of four. There isn’t any street food in Sri Lanka as such but we found lots of cheap cafes that served fresh coconuts, juices and tea and if we stayed in there for an hour or so we never spent more than $15. Wine seems to be non-existent in Sri Lanka (not on our budget anyway). We did buy one bottle of red wine for $18, but we only did this once – it wasn’t good enough to justify the price. We drank beers at certain restaurants. These came in at around $3 each. The local plonk is Arak. It is a strong rum. We bought a few bottles of this and kept it hidden in our hotel room to have with coke. If you would like to know why I had to hide it, read this post. A bottle of Arak costs about $6. 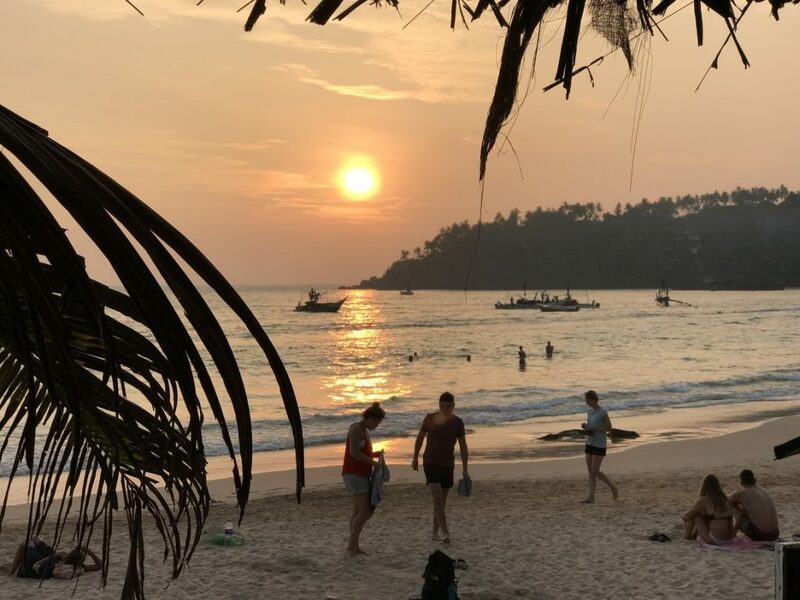 We spent two blissful weeks on the beautiful beach of Mirissa. Apart from the odd bus ride into the next town to look at the markets, this costs us nothing. We had a very lazy two weeks. After we had our fill of the sand, we went to the hill country (Kandy and Ella) where we went trecking and visited temples. Again, the cost of these activities is minimal – $10 max for the four of us to go to a temple. The only thing we splashed out on in Sri Lanka was a guided tour of a tea plantation. Our family are colossal tea lovers, and we couldn’t pass up a chance to visit a working tea plantation. It was worth every penny. Take a look at the tour we used here. Everything else we did was free. It is such a beautiful country you will want to explore by foot. If you are not on a budget like we are, then there are lots and lots of things you can do in Sri Lanka, but we were happy to just soak up the local life, ride the buses and trains and eat lots of food. Don’t mess about trying to get your head around the transport websites in Asia. They are a bit of a minefield, to say the least, and for the sake of paying an agent a few extra dollars, you can save yourself hours of frustration. We only ever use 12GoAsia to book all of our transport tickets in Asia. They have an easy straightforward website and their prices are the best. You book online and pick the tickets up at the station. A ticket from Colombo to Mirissa, for example, cost $3 p/p Yes, you read that right. And it is a fabulous train journey. Go and sit in the doorway of the train and watch the scenery whizz past you. Even the luxury ‘observation carriage train’ that we booked from Colombo to Ella cost us $8 p/p, and this was for a top of the line air-conditioned seat. For short distances- tuk-tuks or the local buses are the cheapest way of getting around in Sri Lanka. We would spend about $3 a day on transport. $35 p/p for a 30 day Visa. Check out your eligibility here. Cost of Flights to and out of Sri Lanka. Skyscanner is the only site that will save you money on flights. Don’t hesitate to use them. A Summary of Costs To Travel Sri Lanka. Cheap, cheap, cheap. We never felt pinched on our budget of $100 a day and easily stuck to it. Granted, we didn’t go and do a lot of the big tourist attractions, instead preferring to walk off on our own and discover things. We ate out every day and went to cafes regularly. We even bought a few new clothes in Sri Lanka. Fabulous country if you are travelling the world on a minimum budget. You will be smiling too when you see how good the food is in India. Our family of four backpacked around India for six weeks. India is famous for being a budget lovers destination and although it perhaps wasn’t as cheap as I imagined it still allowed us to come in under budget. We did get ill a few times while we were in India but medicines are also very cheap in this country. Just an added cost that we weren’t expecting. We never spent more than $30 p/night (for four people) on a room in India. The most we ever paid was when we went to see the Taj and splashed out on a beautiful place for us all. The only room that we ever experienced air conditioning. You can read about the things that shocked us at the Taj here. The accommodation was more than we had been paying in Sri Lanka and the standard wasn’t any better – you still get excited if there is some hot water in the bathroom. This was a bit of a shock at first, but we managed to get lots of good deals. Agoda is the search engine to use when booking hotels in India. They have the most significant range as they compare lots of different websites and find you cheap deals. For the extra money we spent on hotel rooms in India, we saved on food. India is full of cheap places to eat if you stay away from the tourist restaurants and only ever eat locally. Because alcohol is frowned upon in lots of parts of India we never had wine – which saved us money (it made us miserable, but it saved us money). Beers were available in most restaurants – not all, but some. They were cheap too; a meal for four hungry people in India (for some reason we were always hungry in India) cost us in the region of $20 for all of us. The best food we had in the whole of India was at Hassan’s Family Restaurant in Kerala. You can find it on Trip Advisor. I still dream about their Tandoori chicken. If you are in Alleppey, go there. Quite often we would eat street food for dinner too. I really enjoyed doing this at night in India – it was always buzzing and usually meant sitting with the cows at the side of the street, but I loved it. If we had spent too much on an activity, we clawed the money back by eating cheap. When this was the case dinner would cost about $3 for all of us. For those on a budget in Alleppey, Kerala this backwater canoe trip will be everything you are looking for! 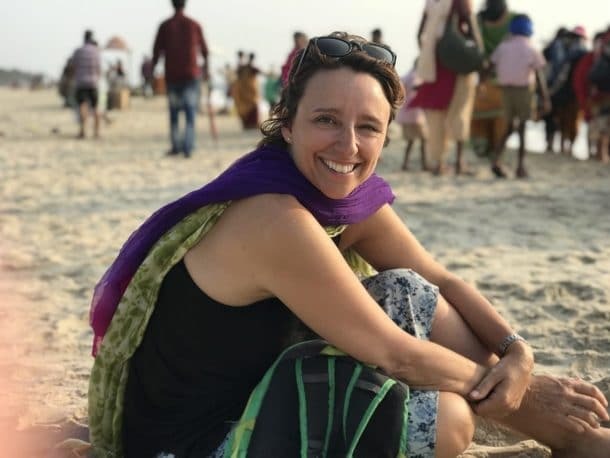 We spent a few weeks living on a beautiful beach in India called Om Beach. It is pretty remote, and there is nothing to do except read, swim and eat at the beach cafes. You can read more about that beach here. Costs while we were there were minimal. 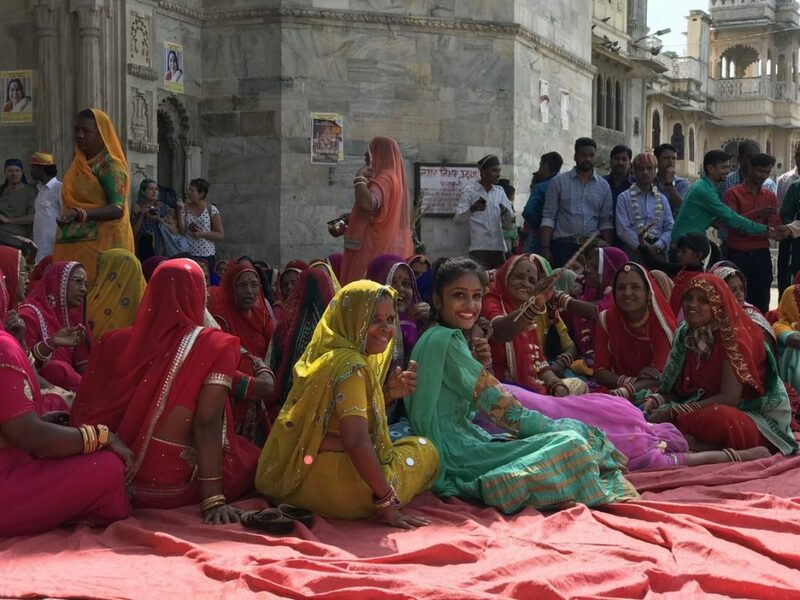 We then went to Rajasthan where we visited palaces and soaked up the local life. At one point we were invited to an Indian wedding which was really special – and free! We visited the Taj Mahal which costs approx $15 p/p. Check prices here. IF YOU ARE LOOKING FOR AN INSPIRATIONAL READ ON HOW TO TRAVEL THE WORLDAND SAVE MONEY WHILE TRAVELLING, BUY THIS BOOK! IT IS PACKED FULL OF TIPS! Again, don’t mess about trying to book your own train and bus tickets in India. Use an online agent. The best one out there is 12GoAsia. They are easy to us and the most competitive. They are the only agent we used in India and they never let us down. 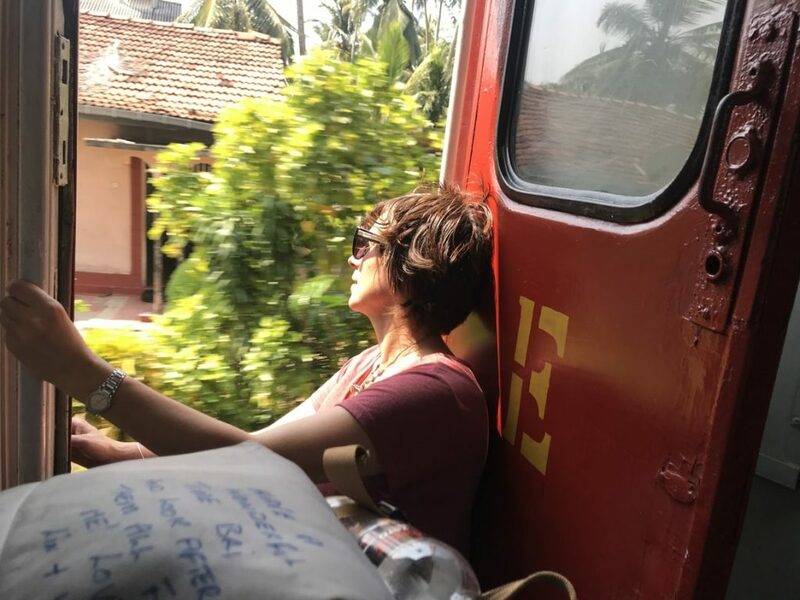 Trains fill up very quickly in India so make sure you book well in advance. We had to travel by overnight sleeper bus three times. It was a nightmare – but it was cheap. To get from Mysore to Gokarna on the sleeper bus cost us $15 p/p. The train from Udaipur to Agra costs $25 p/p. Uber is by far the way to travel when you to go distances over ten kilometres. When we were dropped at the side of a motorway (literally) by the sleeper bus in Mumbai, a tuk-tuk was trying to charge us $12 to take us to the airport. We called an Uber, and they made the trip for $3. Indian Visas are not cheap. The total for 4 of us was $240. Udaipur to Bangkok $322 (4 people). We used Skyscanner, and it showed us that if we flew on Holi Day in India, flights were nearly half price. You can save massive amounts of money on flights if you are flexible on dates. India is cheap but maybe not as much as people are led to believe. Accommodation at this budget doesn’t get you air conditioning. Food is cheap but only if you eat locally (better anyway) and you can save massive amounts on travel if you use the right search engines. The food is some of the best you will find in Asia and best of all? It is cheap! We all loved Thailand so much. After India, it felt like we had stepped into the future! It is clean and calm and civilised. Although not as cheap as India or Sri Lanka, Thailand made up for it in other ways. We rented a house through Airbnb for 15 nights, and this put our budget up. We could have been good and stayed in the cheap hostel rooms ($7 for all of us), and we did do this for a couple of nights on this trip, but we all needed some normality, so we splashed out and rented a house. It was $40 a night. A hotel with air conditioning as standard will cost you about $30 a night. This was a beautiful house with a garden and three bedrooms. A look at how renting a house through Airbnb in Chiang Mai can save your sanity when travelling the world with two teenagers! 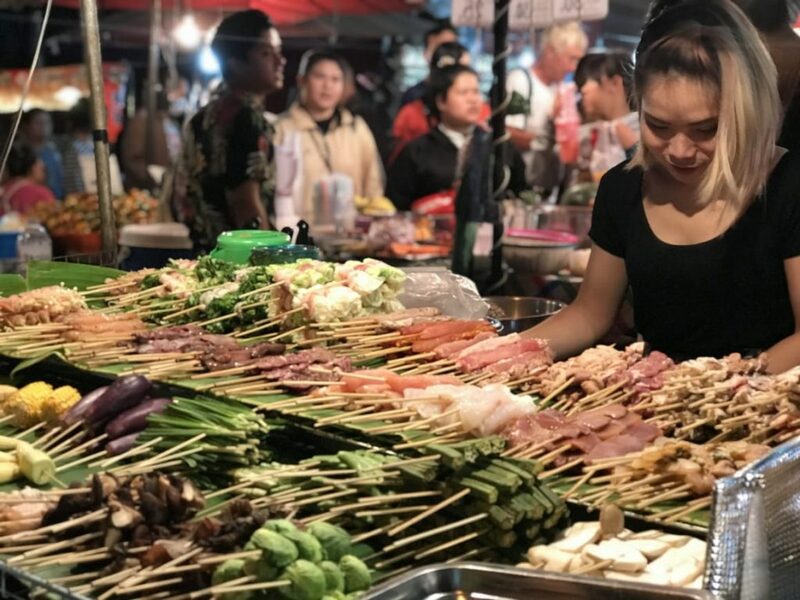 Thailand is abundant with street food, and it is delicious, the fabulous thing about Thailand is that although it is technically called street food, the stalls are more like outside restaurants with tables and chairs at the side of the street – so you don’t feel as though you’re roughing it as such. Of all the places we have been to so far, Thailand is the food that I’ve enjoyed the most. If you eat street food, you are going to pay no more than $10 for a family of 4. Plus a couple of beers are around $2 each. Because we had our own house with cooking facilities, we spent a lot more money on cooking our own meals than we would have had we eaten street food every night. As you can imagine, preparing western food in an Asian country is not very cost effective, and we found that even cheap meals like Spaghetti Bolnaise came to about $20 to cook. We didn’t care though – we needed some familiar food! So yes, the cost of food for us was quite a lot in Thailand. Still, no wine on our radar. At over $20 a bottle, it was far too much, and we stuck to beer. Thailand has fantastic ice coffees and tea, We loved them but tried to avoid buying them from cafes, instead choosing to go to the 7/11 where they were half the price. Thailand is full of 7/11s and this is the cheapest place to buy take away drinks. LOOKING FOR A FABULOUS BOOK ON THAI STREET FOOD? THIS IS IT! GREAT FOR FAMILIARIZING YOURSELF WITH THE DIFFERENT DISHES BEFORE YOU GET THERE! We rented mopeds while we were in Chiang Mai in Northen Thailand and spent a lot of the time driving out to local beauty spots such as The Sticky Waterfall, local temples and the National Park. These were all free. We did go to the fish spa to have our feet nibbled by fish, costing $20 for all of us. We went on a local tour in Bangkok with this company which was probably our most extravagant activities cost at around $60 each. I also had a tooth filled when I was in Thailand and had extra dental work done because the service was exceptional (and cheap). I won’t add this to the budget because hopefully, you won’t have to do the same! The house that we rented came with one moped, but we still had to hire another. This came in at $100 for 15 days. The train from Bangkok to Chiang Mai was our most expensive transport because it was a sleeper train (lovely too!) This cost around $205 for all four of us. We used the online agent 12GoAsia to book our train tickets. The ferry that runs up and down Bangkok is a fabulous way to get around and is very inexpensive. We spent a total of $15 for five days continuous use. Another reason why I love Thailand. 30-day free visa for specific countries and NZ and UK are included – so no cost here! Again, using Skyscanner we managed to get four cheap flights. It meant that we had to fly out of Bangkok so had to pay an extra train fare ($205) but this still worked out less expensive than flying direct from Chaing Mai. Summary of costs to travel to Thailand. We could have spent a lot less in Thailand had we not rented the house and succumbed to our craving for Italian food! Trains are more expensive than anywhere else we had been to but were a joy to travel in. You don’t have to spend lots of money on ‘doing things’ in Thailand as just renting a bike and riding around with the locals is much more fun! Vietnam is one of those places that a little bit of money goes an awful long way. 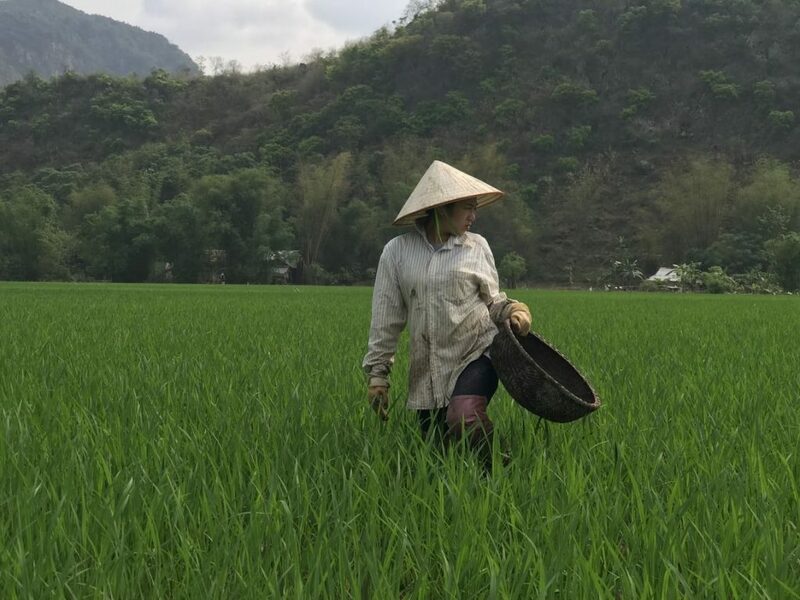 Vietnam is where we are at the time of writing this post and is the cheapest place we have been to in Asia so far. It is like a cross between India and Thailand – taking all the best bits out of each country and making Vietnam. If you want an inexpensive destination when you travel the world, Vietnam is the place to come to. We have travelled from Hanoi to Hoi an, visiting lots of different places in between including Mai Chau and Phong Nha. We have never paid more than $20 a night for a room. Every hotel we have stayed in Vietnam have been huge family rooms meaning that we have saved by having the kids in with us. When we got to Hoi An we were lucky enough to rent a house privately through a friend. Like Thailand, it gives us the luxury of space and cooking facilities and is costing us $25 a night. Again, you can eat for next to nothing in Vietnam. the street food is divine (we are addicted to the bowls of Pho!) and the restaurants (as long as you stay away from the main tourist areas) are very reasonable. We ate porridge for breakfast every day which saves us having to go out – teenagers don’t like mornings… and costs very little. For lunch, we have been splurging on the delicious warm baguettes filled with all kinds of goodies. If we eat street food we pay $3 for all of us, if we eat at a restaurant then it’s $16 for four people including a couple of beers for mum and dad. Because food and accommodation are very inexpensive we have been able to do lots of activities and still stay on budget. One highlight was when we visited the Dark Caves with this tour company it was fabulous. We hired bikes in every place we visited and explored the local area and joined a couple of free walking tours in and around the cities. We didn’t spend a great deal of money and still seemed to see a huge amount of the country. We have taken four long bus trips and an overnight train while in Vietnam. Bus travel is incredibly inexpensive – but long. We paid around $120 for all of our bus travel and $235 for train trips. (Sleeper train. Highly recommend it). The bikes that we rent are $1 p/p a day. The moped hire came in at $7 p/day. The only downside to Vietnam is the cost (and seemingly complicated) Visa system. $50 for one-month multiple entries. Total for four of us $200. We chose the cheapest place to fly out of and arranged a bus. This saved us about $100 using Skyscanner. Summary of costs to travel in Vietnam. I wish we had stayed in Vietnam for longer as our money goes so far. Even the weak NZD. Accommodation is cheap, food is cheap (and delicious) and there are markets galore to wander around and soak up the local life. A top place for those travelling the world on a budget. What do you think? Have you done an around the world trip and if you have how much did it cost you? I’d love to know! It really is the number one question people ask when they hear that you travel around the world. I started out my solo backpacking trip in 2011 and travelled for one full year. I spent in total around 10.000 USD perhaps due to the fact that I spent a lot of time in India, South East Asia and South America, where you can really watch your budget! As a family, your spendings seem pretty ok, you’ll be going home with savings in your pockets 😉 Have fun on your trip and enjoy! Thank you for your comment, Julia! do do it on 10,000 is fantastic! Travelling to countries that are cheap is such a bonus. we are in Japan at the moment and were actually really scared of coming here because of what people had said about the cost. We are Couchsurfing so are spending nothing on accommodation and have found that the supermarkets reduce all their fresh meals to half price after 8 pm. Perfect!! Maybe we will be going home with savings!! Hi Liz – I love reading your funny witty blogs. It’s really awesome your family is doing this world trip, it’s such a life changer in so many ways – happy travels and I’ll have a wine or two for you? That’s for our family of five for a year of RTW travel at today’s exchange rate. Our kids are teens as well. Our own Eastern Canada and 25 other countries. I just found your site today looking for a dose of adventure on the worldtravelfamily blog. I love your blog. And your writing style! We traveled a bit differently than your family, a lot of redeeming and collecting hotel points. And the kids had their own room. At first out of necessity but than out of (our) necessity. I make jokes about being a bit of a princess, but it was really for DH and the kids. Yeah, I’m sticking with that. The first half of our trip (south east Asia) was easy on the wallet, even Japan, but once we hit South America, our daily spend went up. Overland transport was pretty crazy so we took more flights. I really was looking forward to the chicken bus, but…! We also went to South Africa, Zambia, Zimbabwe, Botswana and Lesotho. Some of that was pricey. And we knowingly went out with a bang in England and Ireland right before heading home. We’re back home now for just a bit but we’re heading out again soon. You guys have led a crazy cool life. We’re only a little out there. That is such useful information and great to know about South America. For some reason I assumed it would be cheap to get around that part of the world. You were five too, we were only 4. Would love to go to Africa with the kids too. We have been to Kenya but would love to see more!